WOW! LIBERAL MEDIA HACKS Defend Jim Acosta — Insist WH Video Was Doctored — Attack Infowars — THEN PROVEN WRONG! 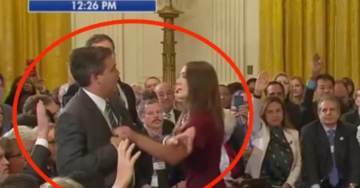 ACOSTA THE CNN IDIOT NEEDS TO BE CHARGED WITH AN ASSAULT… AND A BATTERY MAYBE. THE WH SHOULD PLACE A CRIMINAL CHARGE ON THAT CNN TROUBLE MAKER… WHO DOES NOT REPORT NEWS BUT IS A POLITICAL OPERATIVE FOR DEMONCRAPS.